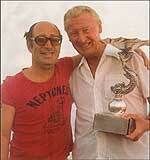 The previous decade ended with John Paris winning the 1989 Waterpolo Player of the Year award and team captain Adrian Cachia following suit in 1990. But the waterpolo fraternity was shell-shocked in June that year when our beloved president Wilfred Mamo was lost at sea On his way to Sardinia to watch England’s opening World Cup soccer match against Eire in Cagliari. The yacht he was on, tragically sank, soon after leaving Mazzara del Vallo. The void Wilfred left was a severe blow for our club and it was very hard for us, especially those who knew him well and worked closely with him, to accept his physical absence. Joe Psaila took over at once and with the help of other members immediately embarked on a very sublime project which had long been a burning ambition of our Mamo-led committee a heated fresh-water swimming pool. Incessant work finally saw this dream materialise and the pool was in full swing in 1992. Meanwhile the young outstanding crop of the 80s were no longer an unbeatable force and the team was struggling when it mattered most. The absence of stalwarts Leonard Cachia, Dorian Pisani, Chris Bonello, Albert Portelli, Ian Azzopardi and Anthony Cachia, among others, was being sorely felt. In 1993 Neptunes were led for most of the season by Guzi Attard while the Russian Sergei Markotch took charge of them with two league matches to go. Top is the group with Attard, Adrian Cachia, David Camilleri, Gianfranco Stellini, Anthony Cachia, Albert Portelli, John Paris, Chris Galea, Dr Michael Gialanze. (Front) Kit manager Ray Spiteri, Jonathan Shaw, Dimitrj Apanasenko, Sean Rizzo, Ian Azzopardi, Chris Bonello and Leonard Cachia. Markotch, Shaw, Dorian Pisani, Adrian Cachia, Paris, Portelli, Stellini, Galea, Leonard Cachia, Apanasenko. (Front) Camilleri, Azzopardi, Anthony Cachia, Bonello and Rizzo. The committee did its utmost to engage some of the best talent available whether on the coaching or the playing staffs. The Yugoslav Josip Kovacevic, Czechoslovak Ladislav Botlik, Russian Sergei Markotch, Italian Salvatore Albo, Croatian Sergio Afric together with local former players Guzi Attard and Tony Camilleri all tried in vain to steer our club to former glories. The players engaged during these ten years under review were Sean Rizzo, Gary Farrugia, Chris Sladden, Silvio Borg, Mirko Vicevic, Vito Padovan, Dimitrij Apanasenko and Alexandre Kolotov – an impressive array! A consistent championship-winning combination simply couldn’t be struck. True to our tradition, however, we won the first edition of the Super-5 Knock Out under Kovacevic in 1990. 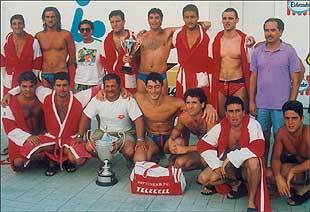 With waterpolo moving to the new National Pool at tal-Qroqq, Neptunes duly obliged by winning the first championship staged there in 1993. In 1994 the Cisk Lager KO preceded the league competition and we won that too. Prior to this, however, there was another “first”. The swimming association introduced the Winter League which has gained popularity every year since 1994. Indeed, Neptunes kept up their record of winning an honour at its inception. It vindicated the committee’s decision to use this initial contest as an opportunity to give youngsters a chance of obtaining muchneeded experience. Niki Lanzon, Karl Galea, Kayne Lanzon, Malcolm Attard, Karl Chetcuti and Miguel Xuereb were considered too young for the job but they did their duty to perfection and this yielded the first Cisk Lager Winter league. 1994: Neptunes winners of the first historic Winter League. (From left) Chris Bonello, Sandro Bianchi, Albert Portelli, Michael Grima and Sean Rizzo (partly hidden), Pablo Vassallo, John Paris, Adrian Cachia, Anthony Cachia, Niki Lanzon, Kayne Lanzon, Gianfranco Stellini, Malcolm Attard, David Camilleri, Salvatore Albo, Jonathan Shaw, Joe Chetcuti. Also in 1994, Neptunes, winners of Cisk Lager Knock-Out. The powers that be tried to deal Neptunes a nasty blow below the belt. Before the 1995 season started we were unjustly accused and harshly penalised on alleged irregularities during the summer league of 1994. We rebutted these charges and tried to seek redress in Court. But in a calmer atmosphere we referred our case to the Malta Olympic Committee appointed tribunal and emerged triumphant when all previous penalties which included that Neptunes were to forfeit four points from the 1995 summer league were quashed! 1999: Winners of the preseason Super Cup competition for the President’s Cup after beating Sliema. We managed to finish runners-up in the winter league although playing with a depleted side. While the senior team was causing disappointment, not so could be said about the youngsters who during these ten years won seven under-14 championships, four under-16 and one under-17 leagues, four under-18 and one under-19 leagues and six corresponding Knock-Out competitions. Other missing cogs during the latter years of this decade were the Championship and Knock-Out senior teams’ honours, which at times we just missed. At least we had the nucleus of a side blended with youth and experience and our aspirations for success were thus laid on solid foundations. Thus the future, considering our talent at the base, looked bright. Neptunes was too eminent a name to be missing from the top honours’ list for a period of years. Our name just had to be there! To maintain our tradition as the island’s foremost club when it comes to providing athletes for the world’s largest sporting manifestation, swimmer Gail Rizzo took part in the 1996 Atlanta Olympic Games.